I'm going to go from LAX to Downtown LA (let's say Walt Disney Concert Hall for definiteness), and I'm going to take metro since it's cheaper than the flyaway bus. 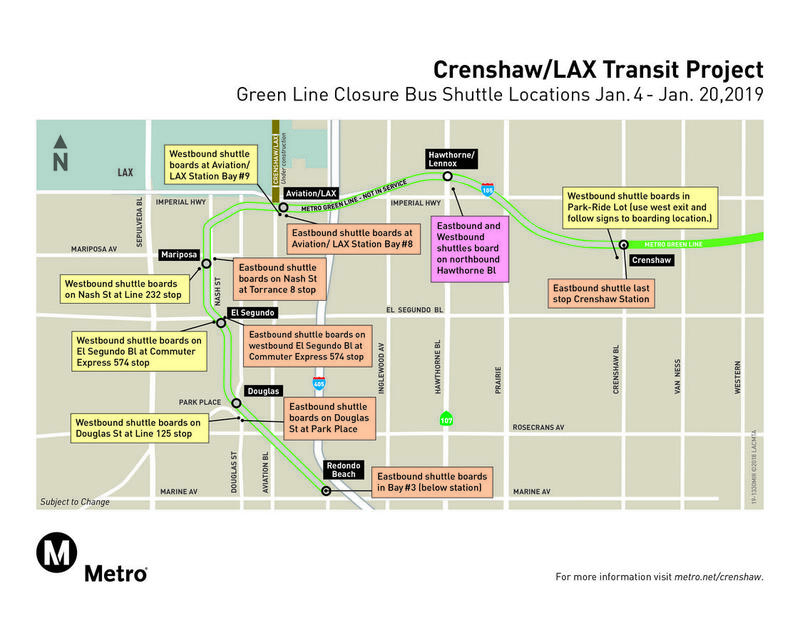 I found some news (https://www.metro.net/projects/green-line-upgrades/lax-transit-options/) saying that the complimentary shuttle (I think it's called route G) will be dropping off passengers at Hawthorne/Lennox Station (as opposed to Aviation/LAX Station). Is this still the case? When I'm returning, should I come to Hawthorne/Lennox Station to take the bus for the airport? (If it's a bad idea to take metro and you think it's worth overpaying for the flyaway bus, let me know, too). I will point you to the Metro site for the Crenshaw/LAX project. At this writing, the Norwalk-bound Green Line will originate at Crenshaw from January 4–20, 2019. The LAX G shuttle will drop off at the closed Aviation/LAX station as usual. There, go to Bay #8 and board Bus #853, a free temporary shuttle serving all the closed Green Line Stations, and ride it eastbound to Crenshaw. On the return, similarly, you would take the Green Line to Crenshaw, board the shuttle from the park-and-ride lot (west exit), and transfer to the LAX G shuttle at Aviation/LAX. Nota bene: the FlyAway bus is less than $10 from LAX to downtown. Taking the G shuttle to the Green Line shuttle to the Green Line to the Blue Line adds at least three transfers and at least one change of mode, and to take advantage of the free transfer at Willowbrook–Rosa Parks you need to buy a TAP card ($1 at a vending machine). Moreover, depending on the time of day, you might spend 20 or 30 minutes waiting for buses and trains to arrive, and the Green and Blue Lines don't exactly serve the most picturesque parts of L.A.
Not the answer you're looking for? Browse other questions tagged usa airport-transfer los-angeles lax or ask your own question.